In a medium bowl, combine the hoisin sauce, pineapple juice, ginger, and sesame oil. Arrange the ribs in a slow cooker and pour half of the sauce mixture over the ribs. Cover and cook on low for 5 to 6 hours or on high for 3 1/2 to 4 hours, until the ribs are very tender. Set the remaining sauce aside in the refrigerator. About 1/2 hour before the ribs are done, remove the sauce from the refrigerator, to bring it to room temperature. 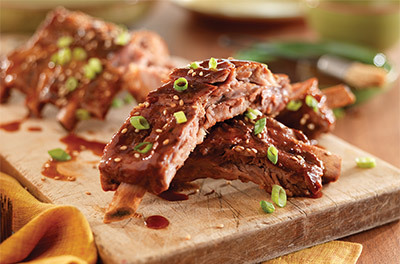 Arrange the ribs on plates or a platter and brush both sides with some of the remaining sauce. Sprinkle with the scallions and sesame seeds, if using. Serve the rest of the remaining sauce at the table. You can find hoisin sauce and sesame oil in the ethnic or Asian section of the store.